Would you kindly bring us the girl and wipe away the debt? Bioshock has always stood out to me as a shining example of the well written Western game. It’s not that the West is lacking in writing talent, but (to perilously separate the gaming industry into two schools) the Japanese have always had the visual novel tradition with no direct analogue in the West short of the odd adventure game. Even then, adventure games are somewhat of a dying breed and more often the West goes by games with stories rather than games ­as­ stories. This is not ‘wrong’ or anything like that; a lot of games are very well written because of (rather than despite) their minimalism e.g. the original Starcraft. Games should be first and foremost fun, but it’s much easier to have a conversation about games-as-art, especially with the sceptic, if the game is not only fun but also compelling. Playing Bioshock allows me to pretend that I’m not a wholly shallow, two dimensional person. 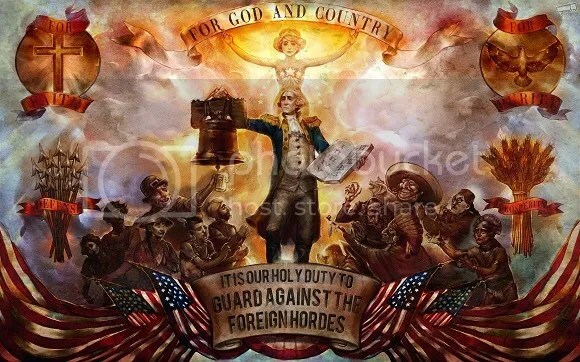 What we will be doing here is having a broad look at what Bioshock Infinite is about, as a story, and what one nerd in a room thinks about it. That’s going to be just as interesting as it sounds, I’m sure. Allow me a tangent for a moment, about Hayao Miyazaki. I owe Miyazaki a great deal personally, mainly because whenever anyone gave me weird looks for watching cartoons from Japan (or, heaven forbid, ‘Japanimation’) I could take out my pipe and monocle and talk about the genius of Miyazaki. Breakout hits like Spirited Away and Princess Mononoke that are recognised in the West helped de-stigmatise my hobby and allowed me to continue wearing my elitist smirk in public. Arguably, though, the most influential works of Miyazaki were much older ones, and for the purposes of Bioshock Infinite specifically Castle in the Sky Laputa. If a city flying in the sky seems like an old trope to you it’s because Miyazaki did it all those years ago, turning Jonathan Swift’s satire into a fantasy archetype. This idea has already been written about on the internet by people who aren’t me, so let me note some influences in Bioshock Infinite. You don’t need to have watched Laputa (though if you haven’t I highly recommend it) to look at Columbia and understand what it stood for: hubris, elitism, man versus nature, power versus control. We can recognise that it represents utopian ideals and can telegraph their ultimate failure. 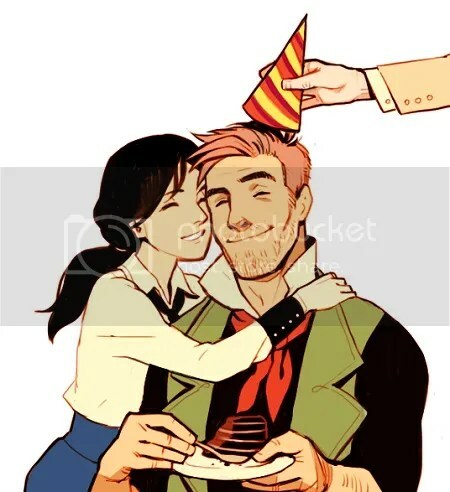 And of course our protagonists are also archetypal, starring the down-to-earth (in more ways than one) action-type Booker Dewitt and the important-in-some-way princess-type Elizabeth. Let me head off some trains of thought here: being derivative isn’t necessarily bad, just as being original doesn’t make something automatically good. It is the way of art to imitate art because some elements just have strong resonance with people, and it’s good to use those elements. Take for example the Hero’s Journey basically used everywhere in all mediums. Immensely popular works like Star Wars basically play it by the book. No one makes a fuss about George Lucas plagiarising Joseph Campbell because the Hero’s Journey is so universal. It’s called the monomyth for a reason. This is not even to say that Bioshock Infinite borrowed very heavily from Miyazaki; it’s just ostensibly influenced, and it isn’t alone in being so. Even though there’s nothing new under the sun–again, did Miyazaki not get the flying city idea from Swift?–it does nothing to stop compelling stories from being written. 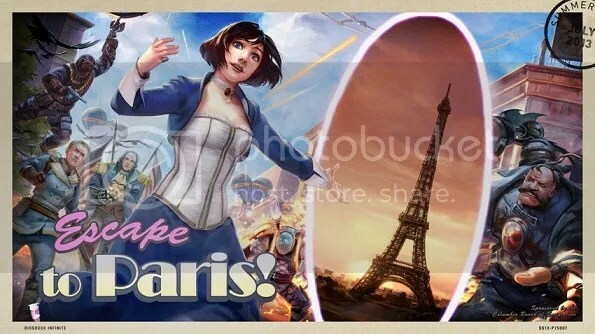 Of course this begs the question of whether Bioshock Infinite’s ended up being ‘compelling’. It’s a rather frivolous thing to ask rhetorically since I can only give my own subjective opinion on it. 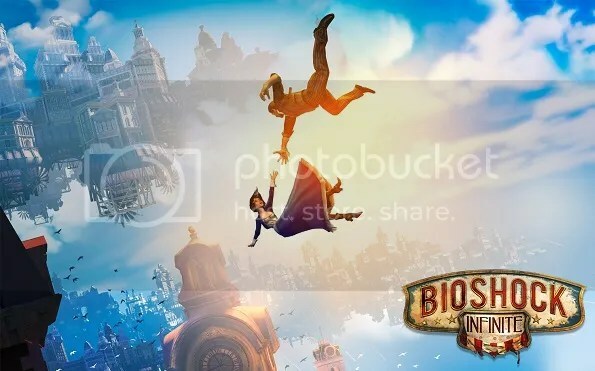 In any case, it won’t be entirely correct to assess Bioshock Infinite as just one story; like many works it is several, woven together into a single telling. Perhaps we should try unravelling it. And, until observed, Booker is both alive and dead simultaneously. Booker infiltrates Columbia–>Booker kills a lot of people–>Booker finds Elizabeth–>Booker loses Elizabeth–>Booker finds Elizabeth–>Booker kills everybody else–>Elizabeth becomes God–>??? Now that was absurdly skeletal and not at all flattering, but it’s entirely possible that someone can finish their playthrough of Bioshock Infinite and come out having lost a lot of meat from the plot. This is probably because Bioshock Infinite makes a point of concealing its plot. Obviously some of the voxophones are just obnoxiously hidden (I thought I was particularly OCD about looking for them and I still missed some) but Bioshock Infinite also likes to communicate in winks and nudges, playing up the mystique and the discovery process. It’s a great feeling when it all comes together (and personally I love ah-ha moments) but if the most common reaction to the ending is ‘wah?’ (though this is only what I’ve heard anecdotally) then perhaps the clues should not have been so optional. Not that there wasn’t a lot to absorb in the first place. Quantum physics, alternate realities, fabricated memories; those who’ve read or watched Steins;Gate (yeah, I recommend that too) will be familiar with how layered it can get. Pulling off something like that without too many glaring plot holes is already quite a feat, in my opinion. Speaking of plot holes, when I finished Bioshock Infinite I had a discussion with a friend about the Luteces. I enjoyed the characters very much–their banter, especially at the opening of the game, was fantastic–but it seemed to me that if they had super omnipresent god powers they could have done more to resolve the conflict actively. My friend remarked that they weren’t just gods; they were Greek gods. A simple statement, but I couldn’t agree more. It’s not hard to see Booker as being the tragic hero of his own drama, guided by his meddling patrons. For those unfamiliar, the Greeks more or less invented the Classical theatrical tradition, and those works, along with the Bible, were pretty much the basis of almost all literature in the West for…well, quite some time. And hey, Bioshock Infinite has both! 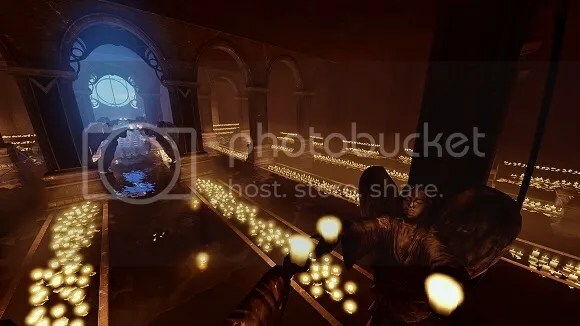 In fact Bioshock has gods of all sorts: we have the concept of the Judaic absentee God, the idolised Comstock and his cult, Elizabeth, and the Luteces. Again, the Luteces are our Greek ones. They contrast the idea of the Judaic God in that Greek gods are pretty much just humans with fancy powers and strange responsibilities. They are characters in their own right and have their own flaws and whimsies, and they get involved with human affairs incessantly. The idea of a god descending from on high and solving problems for our hero–deus ex machina–was a common feature of Greek drama. True to form, the Luteces are merely ascended humans, who realise they’ve done bad, and prod Booker along to try and fix their mess (and perhaps for their own amusement). They seem to put limits on their own interference, preferring aid in the form of riddles and cryptic nonsense. The Greek pantheon were also giant trolls. Contrast the Luteces with Elizabeth. ‘Booker, are you afraid of God?’ ‘No. But I am afraid of you’. By the end of the story the Judaic God is still absent, but Elizabeth essentially takes the same place; she is omniscient and omnipotent, both understanding and terrible. Her mere presence makes the Hero irrelevant. The ending is basically just Elizabeth leading us through and wrapping up the plot. Notice how at that point Elizabeth stops being a character and starts becoming a plot device. Characterisation is about having flaws and having to struggle: absolute power removes both. The danger of having a god in your story–even (or perhaps especially, depending on who you ask) for the Greeks–is that it trivialises the plot. Waving your hand and making problems go away is usually what writers do when they can’t get the internal logic of their narrative to produce a satisfying outcome. Fortunately Bioshock Infinite still manages to somewhat preserve its consistency (though the undermining of Elizabeth as a character was still unfortunate) and would also please the tragedians by still ending the hero’s journey in ‘death’. Don’t worry: Australia had its own share of bigotry we’re familiar with as well. 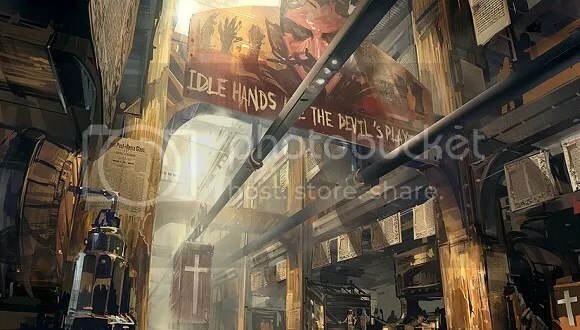 ‘One man, one city’: this seems to be motif of the Bioshock franchise now. Like the original Bioshock, Bioshock Infinite also features an utopian dream ultimately destroyed by elitism. 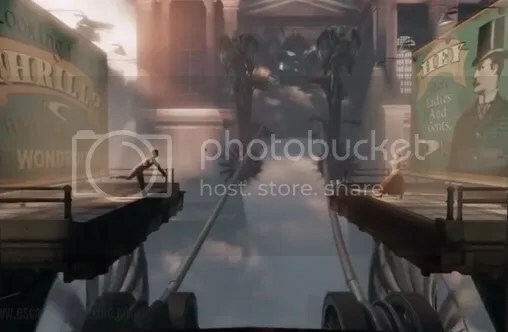 While Bioshock takes place mostly in the aftermath of social collapse, Bioshock Infinite has the player instigate and take part in the class warfare. In a sense, Columbia is a caricature of a caricature. One of side of the civil war we have a stereotyped upper class: very white, very bigoted. On the other there is the full assortment of the traditionally dispossessed: the blacks, the natives, the Irish, the immigrant. This is an old struggle, but played to the extreme in Columbia. The upper class vilifies the lower, and the game in turn vilifies them. Columbia itself is, like Rapture, a twisted version of the American dream, albeit this time a glorified fascist South instead of a Randian utopia. Now, I’m not American and have a limited knowledge of US history, but from what I’ve read about the American Civil War the sticking point was slavery. Columbia evidently never got over Emancipation, demonising Lincoln and glorifying Wilkes Booth. While the great industry of Columbia is no longer fuelled by slaves it is still a system based on a self-proclaimed morally and socially superior people exploiting the rest. Finktown makes us question whether it’s all that much better. Of course this struggle is not just a black and white story, if you’d pardon the unintended pun. The Vox Populi are by no means ‘good guys’, as Elizabeth finds out rather quickly. Their very name is ironic: it evokes images of civil society and the democratic process, but in practice they are militants with revolutionary ideals. The Comstock propaganda machine paints them as violent anarchists, and it turns out this was completely true. At the same time: the chicken or the egg? Perhaps in trying to paint dissidents as monsters Comstock created a monster. Arguably the most important story to run throughout Bioshock Infinite is about redemption, grace, and dealing with one’s choices. There’s a reason the game more or less starts and ends with a ‘baptism’ (and musical motif Amazing Grace). Booker’s personal story is one long search for absolution. He regrets the terrible things he did as a soldier and is confronted with the possibility of atonement through religion. In two separate realities, one Booker decides to try and make peace with his sins by becoming Comstock. Another decides to try and deal with it personally. Both ultimately fail. Comstock becomes a crazed fascist dictator, and instead of making peace with his sins revels in it, creating theme park attractions to glorify his violence and, as one voxophone reveals, to stand proof to his racial purity. Booker is eventually crushed by the weight of his guilt and the death of his wife, takes to alcohol and gambling, and in a drunken fit sells his baby daughter to cover his debts. The Luteces’ eventual intervention via their ‘hairshirt’ Booker is about guilt, Booker’s subconscious motivation for going along is also about guilt, this time with ‘debt’ representing his accumulated sins, and he decides to help Elizabeth despite it because he sees the debt he owes to her. Even Elizabeth eventually directly and indirectly kills and struggles with dealing with the choices she made on escaping the tower, in contrast with her life without choice while within. 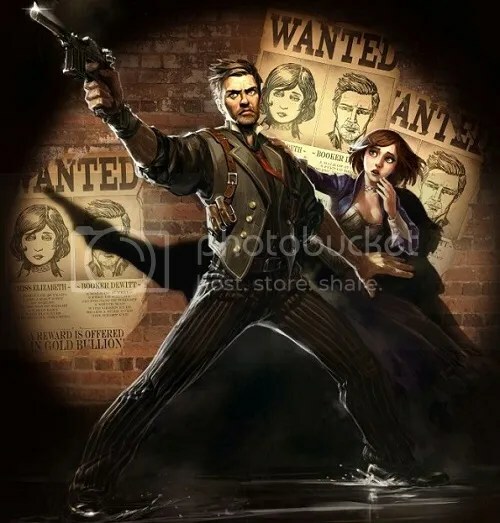 However, Bioshock Infinite treats the subject in a surprising way: deliberately or not, it does not merely reject the idea of redemption but denies any possibility of it. While having to confront the consequences of our actions is a common Aesop for time travel stories, Bioshock Infinite is all for undoing the past. On the balance, apparently, every version of Comstock that ever was must not be allowed to exist. Comstock is irredeemable, Columbia ill-conceived, and Elizabeth’s life in general too awful live. The spectre of Lady Comstock asks whether in a multiverse of infinite possibility there was a world where she succeeds in saving Comstock. The idea is teased but never explored. Neither is Comstock’s character, really: he remains, to the end, little more than the evil megalomaniac he started out as. We never really find out what happened between his baptism and his rise as the Prophet, only that somewhere in between he became a lunatic. Comstock is just a bad man, a Mr Hyde even though Booker is no Dr Jekyll. There’s no need to empathise with this man: just get to killing him. Perhaps to reinforce the fatalistic viewpoint, Bioshock Infinite also removes much of the choice from the player. As a medium that has always considered interactivity its strong point, it is strange for a game to deliberately undermine player choice. No, Mass Effect 3‘s ending was just rushed production and bad writing and shouldn’t count. In the original Bioshock choice was a major theme: a man chooses, a slave obeys, and there are two endings. 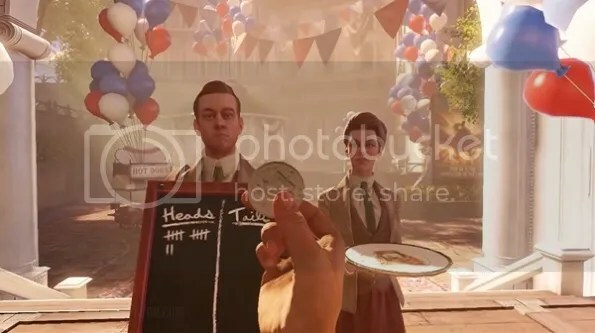 Bioshock Infinite‘s does not have a variable ending like the original; only one choice does anything substantial (netting you an extra piece of random gear) and the rest are only aesthetic. Maybe it’s a nihilistic commentary on the irrelevance of the individual? Maybe it’s a copout? It’s up to personal interpretation. Either way, in the grand scheme what you do in Bioshock Infinite does not matter all that much. I must note that at the time of writing none of the substantive DLCs have yet to be released. Will they add to the story? No idea. In any case I would consider any story you need to pay additionally for to be wholly optional. As it stands, the Bioshock Infinite story is more or less a complete package and overall I enjoyed it. It strove for more complexity than its predecessor and certainly did deliver in that area. Hey, it managed to generate two and a half thousand words of rambling for me, so there must have been something to it. That said, complexity is also often a hindrance in storytelling, muddling the message and confusing the audience. But if you keep your eyes open and your attention span on, Bioshock Infinite gives a lot to think about.